Southern as Biscuits: Local Etsy Celebrating Record Store Day! Local Etsy Celebrating Record Store Day! 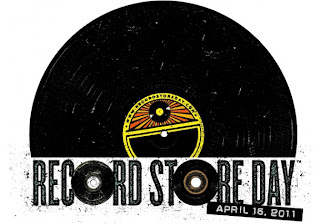 Today is the third Annual Record Store Day, an international celebration of independent record stores. Independent record stores are hard to come by these days. I've made some great finds at Goodwill and Edward McKay's. There is also Earshot on Silas Creek Parkway in Winston-Salem, and Maya Art Gallery & Vintage Media in Greensboro. Comment below if you know of other local independent record stores! In honor of the occasion, Edward McKay Used Books & More have purchased new vinyl and are offering 15% off today. I've gathered a collection of local vinyl-themed Etsy for your buying and listening pleasure. Check out that tee with the Raleigh skyline and the rare red vinyl! Thank you for supporting local artisans and independent record stores!